An accomplished beader and teacher for 20+ years, Leslie Granbeck's talents took a new direction when she discovered the technique of turning wool fibers into beads and jewelry. 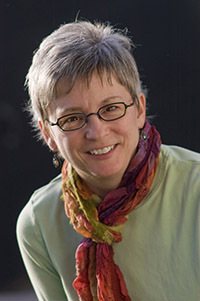 Intrigued by color, texture and always looking for new challenges, her portfolio grew to include the art of feltmaking. "Feltmaking is magical. Imagine turning simple wool fibers into beautiful scarves, purses, slippers, even garments." Leslie teaches a variety of feltmaking techniques: traditional wet felting, needle felting, nuno felting, and her favorite – three-dimensional seamless felting. Her classes are full of color, creativity and adventure. They also include a free workout as feltmaking is a “physical art”. 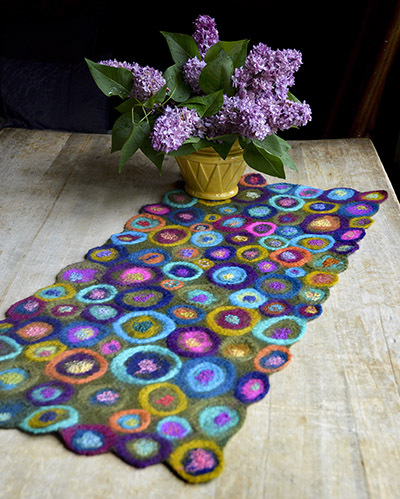 When not teaching, you’ll find Leslie in her home studio working on new fiber projects. Leslie has traveled around the globe, is a professional photographer and speaks Spanish. Felt a beautiful table runner or wall hanging using wool from local sheep. Learn to layer naturally colored fibers, then add texture and color with a variety of embellishing techniques, including silk paper you make in class. Join felter and instructor Leslie Granbeck on Saturday, July 20, from 10am-3:30pm. Add your own creative touches for a one-of-a-kind accessory. $25 materials fee includes all fibers and supplies, including a reusable felting kit. Bring from home: Sharp scissors, 2-3 hand towels, 1 old bath towel, plastic bag to carry home wet items and a bag lunch. Optional: apron. Price is $53 plus $25 supplies. Older teens are welcome.